Sonae Arauco was present at Archi Summit 2017, which was held on 6th and 7th July in the Portugal Pavilion in Lisbon. The choice of venue was a tribute to the work of architect Álvaro Siza Vieira. At this third event, Sonae Arauco presented the Innovus Decorative Products brand with more than 200 references to choose from, of note being the Innovus Coloured MDF ranges, which make it possible to create tailored environments through the use of different colours, and Innovus Essence, which focuses on the textures reminiscent of the beauty of solid wood. 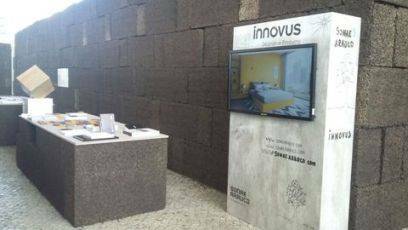 But the Sonae Arauco products at Archi Summit 2017 were not just on display at the stand, they were also present through a product in the Coloured MDF range, Sand Grey, used on all of the stands for the 30 companies at the event, which gave rise to much curiosity about this material from the over 1300 visitors. 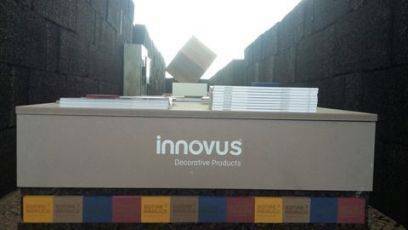 Innovus Coloured MDF combines high mechanical performance and machinability with the variability of a product filled with light. The use of pigments ensures an organic, natural look to the items. It makes it possible to create new concepts and design personalised environments, living up to the expectations of every customer. Another possibility is the application of stain or varnish on the surface of this product, combining different finishes and increasing its efficiency even further. The Innovus Essence range consists of decorative panels for indoor use. These products have a melamine surface and perfectly synchronised embossing (EIR) with the veins and knots in wood. Both sides of the panels have this finish, guaranteeing the singular feel and beauty of the product. The characteristics of Innovus Essence panels bring to mind solid wood, creating inspiring settings. The use of the online digital simulator also came under public scrutiny, and is considered an example of innovation and development by Sonae Arauco. This is a tool integrated into the company's website that lets users experiment with the various decorative products in unique settings. Also of note was the presence of Sonae Arauco's Specification & Contracting team, who were fundamental for answering questions and talking about the potential of the products and the variety of ways these and other Sonae Arauco products can be used.